Once just a small picturesque fishing village, Cascais (pronounced 'Kesh-kaysh'), 19 miles (30km) west of Lisbon, has exploded into one of the most bustling, sophisticated holiday resorts on the Portuguese Riviera. It retains its laid-back atmosphere, however, and the local fishermen still ply their trade and auction their catch on the main square. Cascais town now hosts a plethora of elegant shops, bars and eateries set around colourful cobblestone walkways, to cater for the holidaymakers, and besides the lovely local beaches there are some sightseeing opportunities. Cascais' 16th century church has carved and gilded woodwork and some famous paintings, while the Cascais Amunicipal Museum is housed in a palace and has some interesting exhibits and illuminated manuscripts. The Sea Museum contains everything maritime from model boats to fishermen's boots, and the 16th century Fort of Cascais offers a beautiful view and an open-air artillery museum. About two miles (3km) out of Cascais is a strange rock formation known as the Mouth of Hell, which is worth a look en route to the lovely beach of Guincho, which is a holiday favourite for surfers. Shopping in Cascais' town centre is an enjoyable pastime, exploring the Rua da Raita pedestrianised street which offers numerous small shops selling local wares, including hand-embroidered linen and hand-painted tiles and other ceramics. Along the beachfront are the ubiquitous open-fronted stores and kiosks selling holiday requisites like buckets and spades, sunglasses and sunscreen. For local colour the place to be is on the Rua Mercado on Wednesdays or Saturday mornings when the farmer's market is held, selling fresh produce and plenty of other goods. Glitzy shopping is at the huge Shopping Cascais Centre, out of town on the highway to Sintra, where there are two floors with hundreds of stores dealing mainly in clothing, accessories, furniture and household goods. 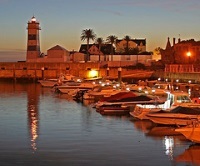 Cascais is renowned for its quality dining, drawing gourmets from Lisbon and nearby Estoril. The main restaurant strip of Cascais is the walk-through Rua Frederico Arouca, and the lively Largo Luis de Camoes. Here you will find a wide choice of eateries, most with outside areas, from cafes to traditional taverns, serving both local fare and international cuisine. Fish restaurants abound; be warned it is said that one should not eat fish in Portugal on Mondays, because fishermen do not go to sea on Sundays! Specialities of the Estoril coast are fish stew, sole, dried codfish, lobster and crab. Spicy chicken dishes are also popular. Enjoy the reasonably priced good local wines. Popular restaurants in Cascais include the Michelin-starred Fortaleza do Guincho, and the local seafood at Restaurante B and B. The Cascais resort has a vibrant nightlife, offering everything from traditional Fado to wild dance clubs. Largo Luiz de Camoes Square is the hub of the hotspots, with a collection of bars and clubs. Most popular and lively of the clubs, Coconuts, is however to the west of the town on the seafront, with a bar and dance floor. Other favourites include Baluarte, Ferdi's, O' Neills Irish Pub and Bally Bally Pub. The focus of daytime activity while on holiday in Cascais are the local beaches, but those who want a break from sand and sun can tour some worthy local sights, like the Church of Our Lady of the Assumption, which features paintings by 17th-century female artist Josefa de Obidos. There are a couple of museums, displaying maritime relics and items depicting the history of Cascais. The Parque do Marechal Carmona is also worth a visit, offering shady picnic spots and a small zoo. Most visitors take an excursion to the Boca do Inferno, a scenic spot where waves tumble into a hole in the cliff. Visitors staying near the centre of town may find it quite noisy.